Common systems in the modern engineering to be investigated are multiple-input and multiple-output (MIMO) systems. Quite often, the performances of such systems are verified solely through measurement since the electromagnetic (EM) simulations are rather complex. One of the investigation methods is to place two or more antennas inside of an anechoic chamber and to investigate MIMO device under test (DUT). In this particular case, over-the-air (OTA) analysis will be used to determine system performance. 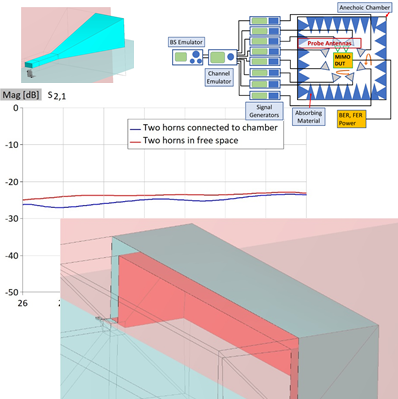 Thi s application notes describes a simplified MIMO scenario showing how multiple horn antennas can be placed inside a large material coated anechoic chamber to test their OTA compatibility. The material characteristic is often unknown, but we show a simple procedure to emulate the characteristic satisfying the simulation demands. The simulations are carried out on multicore CPU and multi-GPU workstation so that simulation times are very short for a very wide frequency band. Built-in interpolation allows quite smooth results, even with 15 points in a very wide band. If a single point is needed, the simulation can be carried out on a regular desktop PC equipped with a single GPU card, owing to GPU solver. The simulation time dramatically depends whether the frequency point is closer to start or end of the band. Although the realistic problem where 80 lambda long anechoic chamber is covered with absorbers seems unreachable to full-wave EM solvers, WIPL-D software suite proves otherwise. Efficient numerical kernel, usage of GPU cards and WIPL-D GPU solver, efficient characterization of the coating material lead to straightforward simulation carried out in reasonable time. For full version of the document, please check the following pdf.